This article was originally published on the political blog Left Foot Forward. 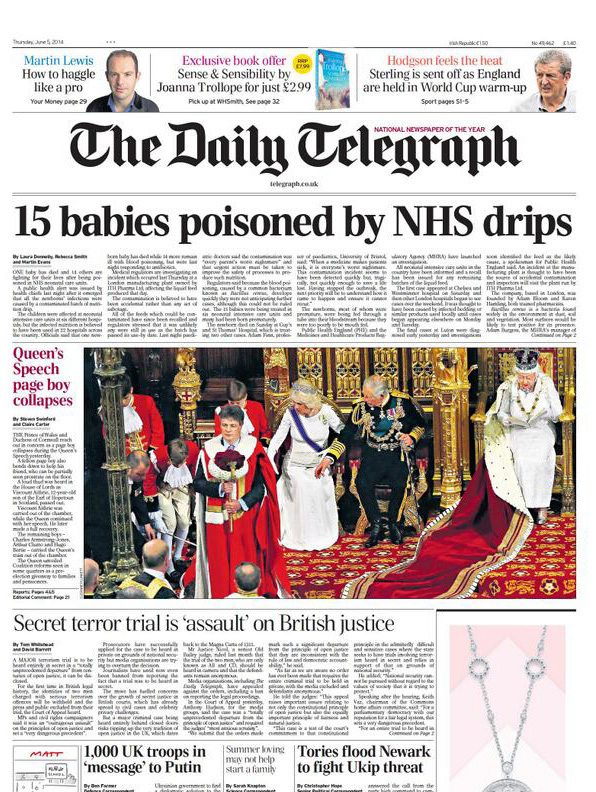 The headline ’15 babies poisoned by NHS drips’ dominates the front page of the Daily Telegraph today. The article reveals that contaminated IV drips have caused septicaemia in 15 patients, including the tragic death of a newborn baby. Every reader will feel great sympathy with anyone affected by this harrowing case, and safeguards are currently in place to protect others from immediate harm. However, perhaps most surprising is the Daily Telegraph’s eagerness to gain cheap political capital out of such a sensitive and heart-breaking accident. ’15 babies poisoned by NHS drips,’ reads the headline. Not content with leading their front page with the news of an infant’s death, the newspaper curiously felt the need to emphasise that these were ‘NHS drips’. Yet on closer investigation, it seems that the error was likely a fault of the manufacturer of the medicines, rather than the National Health Service; the infection was discovered at six different hospitals, up to 100 miles apart. When considering this, it seems wholly unlikely that the actions of NHS staff caused these cases. It appears rather more likely that the disaster was due to a faulty batch of the drips, produced by the company ITH Pharma Limited. Whilst it’d be unfair to make any accusations without further evidence, the Medicines and Healthcare Products Regulatory Authority (MHRA) have contacted company staff, and a formal investigation is likely to be launched into the suppliers. Why then, is it acceptable for the Telegraph to so hastily blame ‘NHS drips’ for the tragedy? Yes, the drips were used in an NHS hospital, but a faulty batch of privately manufactured medicines could’ve caused infection at any institution; NHS or otherwise. This case constitutes yet another unfounded attack by the media on the National Health Service. And this is what is so insidious about private healthcare and its comparison with the NHS in the media. Private healthcare functions on the principle of cherry-picking; providing care for treatments which are ‘profitable,’ whilst neglecting patients with more complex, expensive complications. Indeed, only two months ago, it was revealed that the private healthcare firm Bupa was bribing their patients to use NHS services in order to maximise the company’s profit. Yet this scandal received only limited attention in our partisan media. It is these criticisms that the press consistently fail to recognise when cramming their media output with stories engineered to constantly berate and lambaste the National Health Service. Whether analysing the media’s revelling at the news of NHS doctors making a mistake, demonising treatment options or disproportionately reporting on the NHS’ failures, it is no surprise that public attitudes towards the NHS are suffering, despite it being one of the most efficient healthcare models in the world. Worse still, a media which so readily criticises such a widely-cherished public institution also sets the tone of our political debate. Hence, it is unsurprising that Jeremy Hunt blames doctors and nurses for healthcare scandals instead of acknowledging the effects of unrealistic and dangerous government targets. That he is able to describe the NHS as “cold” and “cruel”. That he is able to support legislation allowing up to 49% of a hospital’s income to come from private patients, in order to make “efficiency savings”. And that he is able to gain powers which permit him to close any NHS hospital without consultation, whilst failing to provide the funding required to meet the healthcare challenges of an ageing population and an obesity epidemic. The media’s constant berating and condemnation of the NHS clearly has real and serious effects that foster mistrust, suspicion and ultimately weaken the National Health Service. Moreover, in times of tragic news such as that released today, it is more important than ever for our media to maintain its commitment to impartiality and accuracy. This is why the Telegraph’s actions are wholly irresponsible. It is deplorable and absurd to the blame the NHS for such a sensitive, unresolved case, in order to propagate a belief that our health service is failing. To hijack the tragic death of an infant for political gain is fundamentally unethical – on this occasion, the media’s obsession with criticising the NHS really has gone too far.